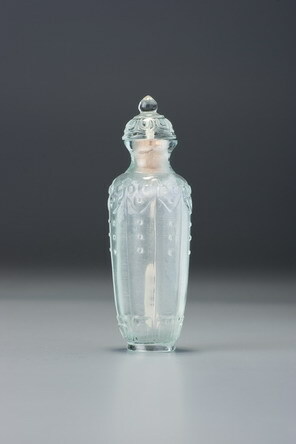 This elegant bottle is a rare example of this form that can be attributable to an Imperial workshop, and probably to the palace workshops. It is superbly formed and painstakingly hollowed, with the lipped upper neck rim so typical of palace hardstone carving and a neatly recessed flat, circular foot surrounded by a narrow footrim. 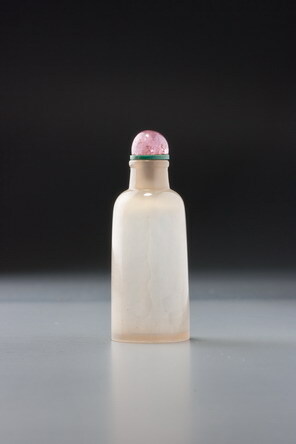 Another version, of similar form but in white nephrite, probably from the same workshop, was exhibited at the Hong Kong Museum of Art in 1978 (Snuff Bottles of the Ch’ing Dynasty, no. 155). The hallmark on the foot of this bottle, Yi Jin Zhai, is that of Yongxing, (1752–1823), the eleventh son of the Qianlong emperor. In 1789, Yongxing became the first Prince Cheng. (See Hummel, Eminent Chinese of the Ch’ing Period, pp. 962 – 963 for a biography in English.) The name of his studio derives from the fact that the Jin dynasty (265 – 420) was considered the fountainhead of cursive- and regular-script calligraphy. As a collector and a calligrapher, Yongxing preserved that heritage in his studio. This bottle confirms that the technical and artistic standards of the late Qianlong era continued well into the nineteenth century in many art forms. A realgar-glass bottle bearing the Yi Jin zhai hall mark was sold in Sale 1, lot 72. Another, in crystal, is illustrated in Hall 1993, no. 28.